Have something to tell APSF? Have a question for APSF? Please contact Dr. Warner by e-mail (warner@apsf.org). Dr. Warner will attempt to respond to all e-mail inquiries within 24 hours (Monday-Friday). 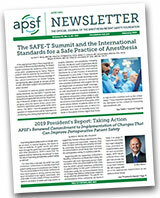 For issues related to the APSF Newsletter, email the Editor-in-Chief, Steven B. Greenberg, MD at greenberg@apsf.org. President: Mark A. Warner, M.D.